In 1934, American archaeologist Nelson Glueck named one of the largest known copper production sites of the Levant "Slaves' Hill." This hilltop station, located deep in Israel's Arava Valley, seemed to bear all the marks of an Iron Age slave camp – fiery furnaces, harsh desert conditions, and a massive barrier preventing escape. New evidence uncovered by Tel Aviv University archaeologists, however, overturns this entire narrative. 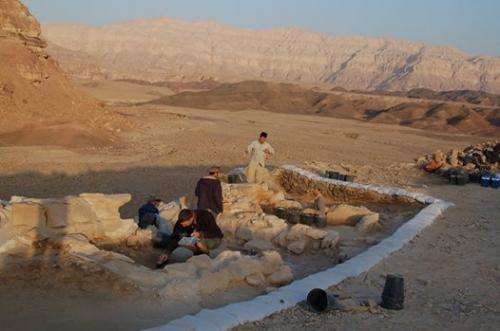 In the course of ongoing excavations at Timna Valley, Dr. Erez Ben-Yosef and Dr. Lidar Sapir-Hen of TAU's Department of Archaeology and Near Eastern Cultures analyzed remnants of food eaten by copper smelters 3,000 years ago. The result of this analysis, published in the journal Antiquity, indicates that the laborers operating the furnaces were in fact skilled craftsmen who enjoyed high social status and adulation. They believe their discovery may have ramifications for similar sites across the region. "What we found represents a general trend or reality related to metal workers in antiquity," said Dr. Ben-Yosef. "They had a very unique role in society, and we can demonstrate this by looking at Timna." The rare arid conditions of Timna have resulted in unparalleled preservation of organic materials usually destroyed by the march of time: bones, seeds, fruits, and even fabric dating back to the 10th century B.C.E. Using a technique called "wet sieving," the archaeologists found miniscule animal and fish bones, evidence of a rich and diverse diet. "The copper smelters were given the better cuts of meat – the meatiest parts of the animals," said Dr. Sapir-Hen. "Someone took great care to give the people working in the furnaces the best of everything. They also enjoyed fish, which must have been brought from the Mediterranean hundreds of kilometers away. This was not the diet of slaves but of highly-regarded, maybe even worshipped, craftsmen." Copper, used at the time to produce tools and weapons, was the most valuable resource in ancient societies. According to Dr. Ben-Yosef, the smelters needed to be well-versed in the sophisticated technology required to turn stone into usable copper. This knowledge was so advanced for the time it may have been considered magical or supernatural. "Like oil today, copper was a source of great power," said Dr. Ben-Yosef. "If a person had the exceptional knowledge to 'create copper,' it is not surprising he would have been treated well. In comparing our findings to current ethnographic accounts from Africa, we see smelters worshipped and even honored with animal sacrifices." Copper production is a complex operation requiring many levels of expertise. Ancient mine workers at Timna may have indeed been slaves or prisoners, because theirs was a simple task performed under severe conditions. However, the act of smelting, turning stone into metal, required an enormous amount of skill and leadership. The smelter had to build a furnace out of clay in precise dimensions, provide the right amount of oxygen and charcoal, maintain a 1,200 degree (Celsius) heat, connect bellow pipes, blow a fixed amount of air, and add an exact mixture of minerals. All told, the smelter had to manage some 30-40 variables in order to produce the coveted copper ingots. According to Dr. Sapir-Hen, an expert on early complex societies, the food remains reflect the social stratification of different laborers at the site. "By studying the remains of domesticated food animals, we reveal differential access to meat that may indicate different levels of specialization among workers at the same site. This allowed us to reconstruct social diversity at the site," said Dr. Sapir-Hen. The remains of the wall found at the Timna site, once considered a barrier used to contain slave laborers, apparently played a different role as well. "We now know it was a wall used to defend the sophisticated technology and its most precious product – the ingot, the result of the complex copper smelting process," said Dr. Ben-Yosef. The research on the ancient societies of Timna continues as part of the Central Timna Valley (CTV) Project of Tel Aviv University.
. . . and much more of the same stuff from the book of Ezekial chapter 6. How did the Hebrews go from the northern moderate to free thinking Israelites to the southern highland conservative anti-knowledge Judahites? One reason is the Assyrians came in around 800 B.C. and took the skilled northerners away never to be seen again, leaving the ignorant south to brew their superstitious right(modern political term). One should also see the book of Deuteronomy which is full of how they were patterning their myths in terms of nature, but then King Josiah, an extremist rightwing superstitious went on an anti-knowledge compaign. Ezekial 8:7 And he brought me to the door of the court; and when I looked, behold a hole in the wall. and what did he behold, Jews worshipping nature! Oh no! They're not worshipping my Jehovah god; they must be struck down! And of course more goodies from Ezekial chapter 8, 8:14 Then he brought me to the door of the gate of the LORD's house which was toward the north; and, behold, there sat women weeping for Tammuz. Tammuz, a Mesopotamian sungod . . . these jews are drifting from the anti-nature exploration Jehovah god; must prophecy their doom! Ezekial 8:16 And he brought me into the inner court of the LORD's house, and, behold, at the door of the temple of the LORD, between the porch and the altar, were about five and twenty men, with their backs toward the temple of the LORD, and their faces toward the east; and they worshipped the sun toward the east.
. . . and those traiters were worshipping the sun toward the east . . .
We have irrationalists amongst scientists. Not that I didn't know this before!